A pretty printing library based on Wadler's paper "A Prettier Printer". 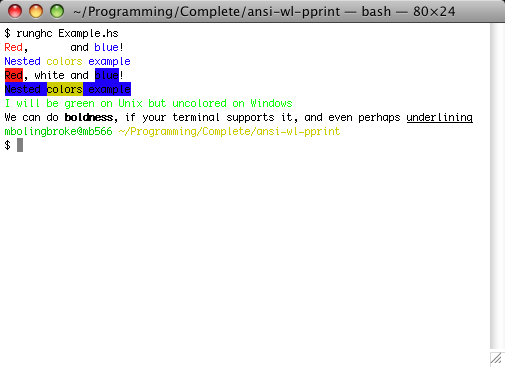 It has been enhanced with support for ANSI terminal colored output using the ansi-terminal package. This package is extensively based on Daan Leijen's excellent wl-pprint library. putDoc $ red (text "Red") <> comma <+> white (text "white") <+> text "and"
Download this project in either zip or tar formats. You can report a bug online.